World Scout Moots are gatherings of members of senior branches of National Scout Associations (traditionally called Rovers) and other young adult members. Participants range in age from 18 to 26. Moots provide an opportunity for young adults in Scouting to meet together with the objective of improving their international understanding as citizens of the world. The first World Scout Moot was in 1931 and following ones were held almost every four years until 1961. Originally entitled the "World Rover Moot", the Moot was replaced by World Moot Years between 1965 and 1982. This was done with the aim of increasing the number of events and accessibility to Rovers. In 1985, the World Scout Conference decided to reinstate the World Scout Moot and, in 1993 decided to hold the Moot every four years. Exceptionally, the 13th World Scout Moot in Kenya in 2010 - the first ever such event to take place in Africa - was held 6 years after the previous Moot in Taiwan and three years before the forthcoming Moot, scheduled to take place in Canada in 2013. The 15th World Scout Moot will take place in Iceland in 2017. 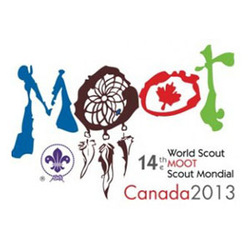 For more information visit www.mootcanada2013.ca or contact your local scout service center.